It was a good lecture by the Bishop of Leeds, if a little long. Delivered to mark the centennial celebrations of Bradford Cathedral, he expounded some of the root causes of populism and delved into the nuances and complexities of the current murky world scene. He moves seamlessly from history to philosophy; from linguistics to human nature. And he ventured a sound Christian response to the populist phenomenon, grounded in future hope and present grace, appealing for an understanding of what drives the mob to worship golden calves or demand the freedom of Barabbas. He railed against the Far Right and the Evangelical Right and bashed lots of right-wing politicians (is there no Far Left extremism or left-wing populism? ), and he shone a distinct beam of light into the Brexit darkness. …we have to learn to pay attention to those things in our society that need to be encouraged (kindness, generosity, justice and humaneness) and identify and challenge those that are destructive. Christians are called to be realists, not fantasists – loving truth (even when it is hard to discern but important to plug away at) and resisting lies, misrepresentation, manipulation and subterfuge. Lovers of light and not colluders with darkness. Three years ago it was unthinkable that a divorced atheist could be elected as President of the United States or an amoral liar could be appointed as the UK’s Foreign Secretary. 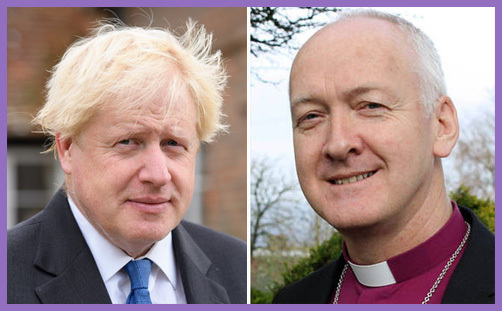 Let’s set aside Donald Trump’s divorces and the Bishop’s judgment of the President’s atheism (which is more likely to be total apathy): the grenade lobbed in Boris Johnson’s general direction is really rather astonishing. What happened to “kindness, generosity, justice and humaneness”? The former Foreign Secretary may indeed be amoral, and he may indeed have told lies, but quite a few politicians are and do. The Leader of the Opposition, for example, isn’t averse to amorality and lies; in fact, all democratic politicians are economical with the actualité. The political lie can be ‘noble’, as Socrates observed, because politics permits lies in order to seek a greater rational truth. You may abhor the very notion, but a philosopher-chancellor who admits in advance that he is about to devalue his currency, or the philosopher-prime-minister who answers truthfully in Parliament a question relating to national security, may cause considerable human suffering. A lie that prevents a catastrophe is a noble lie: it is axiomatic that politicians find (or are given) ethical justification for what may be judged unethical behaviour. Practically and as a priority, however, we can pay attention to the language we use in shaping the discourse in a collapsing society. I have spent a considerable amount of time on Brexit and the fierce debates in Parliament. I have repeatedly pleaded for our legislature to watch its language and do something to redeem our articulated common life. Everyone agrees, but many then promptly revert to the categorising and mudslinging. I could illustrate this at length. No need: his lecture illustrated this succinctly. Or perhaps categorising Boris Johnson as an “amoral liar” is justifiable mudslinging because it is true and must be shouted from the rooftops to warn voters of his propensity for misrepresentation, manipulation and subterfuge? We must be “Lovers of light and not colluders with darkness”, the Bishop says, and Boris belongs to the Dark Side, doesn’t he? Is that what he’s saying? Is that why he singles out Boris above every other politician in Parliament? He says: “I don’t mean to encourage the ad hominem bitchiness that targets individuals, questions their motives at every turn, and abuses them with language that dehumanises”, and yet Boris Johnson is the exception. “Those who represent us in our parliamentary (and local) democracy need our prayers and our encouragement”, except, it seems, Boris Johnson, who deserves a slap more than a prayer; a personal attack more than encouragement. The Bishop of Leeds can’t forgive this, can he (though he clearly forgives Gisela Stuart [Labour, German])? This is the unforgivable lie, isn’t it? This is the proof of Boris Johnson’s amorality, isn’t it? Except the UK most definitely is a net contributor to the EU. You can quibble over whether we currently contribute £12 billion or £9 billion, but either way it’s an awful lot of money. 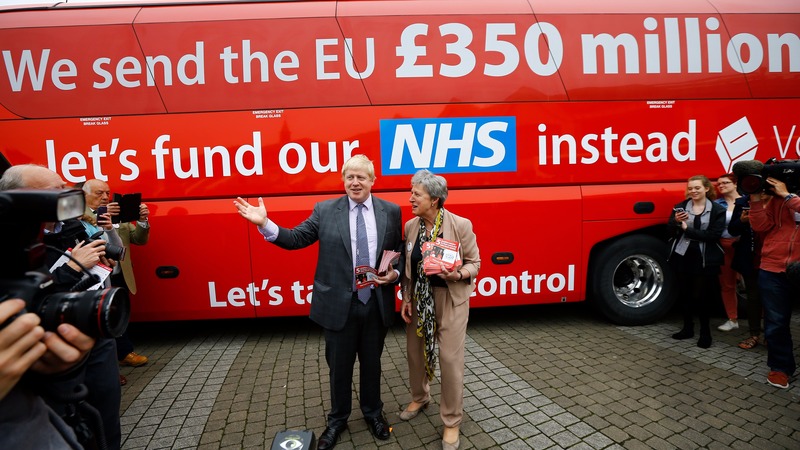 Would the Bishop have been happier with Boris if this bus had said £250 million? Or is his problem with the cynical ‘pledge’ to give it all to the NHS? Look at the wording. “Let’s fund our NHS instead”, the slogan says. That isn’t a promise or a commitment; it is an exhortation, an aspiration, an illustration of what could be done with the money we currently pay to the EU if we were to leave. It isn’t at all clear why the Bishop is so hung up on this bus. Is “Let us pray” any kind of promise or assurance of prayer? Isn’t “Let’s fund our NHS” simply beseeching voters to think outside the EU box and consider what political autonomy and fiscal freedom may result? Is it amoral to posit this? Is it a lie to propagate it? Or is it an amoral lie to disseminate that this damned bus made any kind of guarantee to anyone about anything?